With a bright white finish and distressing along the edges, this upcycled wood fiber picture frame is an eco-friendly, exceptional value. It features a bold 4” canvas-friendly profile. This farmhouse decor style looks beautiful with fine art, family photos, special awards or diplomas and is a great choice for larger presentations. Lightning fast shipping. Made in the USA. I really like the style of frame for my prints, but disappointed one corner was not cut at a quality 45 degree angle, but overall made my prints really pop. Hi Tracey. Thank you so much for taking the time to write your review. We are pleased that you like the style of the frame! However, we regret to hear that the frame was lacking a smooth 45 degree angled cut. If you could please email me photos of the frame, I will be glad to send a replacement frame at no charge. When you have the opportunity, please email the photos to customercare@pictureframes.com- attention Shea J. We will make sure to double inspect the replacement frame's corners very carefully. Thank you for letting us make this right with you. Have a great day! The frames were beautiful and great quality. I had ordered from a different company prior and had to return them because of the poor quality. These are a 10. My only reason for not giving 5 stars is I had six frames and had to install all of the hanging hardware myself. Usually frames come with installed hardware on the back that you can just hang the picture in any direction. I also felt the cost was reasonable and less than a custom frame store. Hello Steve! Thank you so much for your feedback. We really appreciate your kind words regarding the great quality of our Custom Frames! We aim to exceed our expectations with every order you place with us. Allow me to elaborate a little on why we don't add hanging wire to the back of our frames. We welcome more feedback from you after you hear our reasoning. We typically leave the hanging hardware off the frames since we send "wire" as a hanging apparatus on our Wood Frame. By leaving the wire off the back of the frame, that allows the artwork to be easily installed inside the frame. Also, the hanging wire does not allow you to turn the orientation to portrait or landscape as easily. If you have any further questions, please don't hesitate to reach out to us! Happy Framing! This heavy frame is made with quality construction. Love this frame. It was exactly as described online and arrived in a timely manner It’s beautiful! I love the frame but am having trouble securing the canvas. Maybe I was suppose to purchase a paper backing to secure it in place. It’s beautiful! Hi Linda, thank you for your feedback. 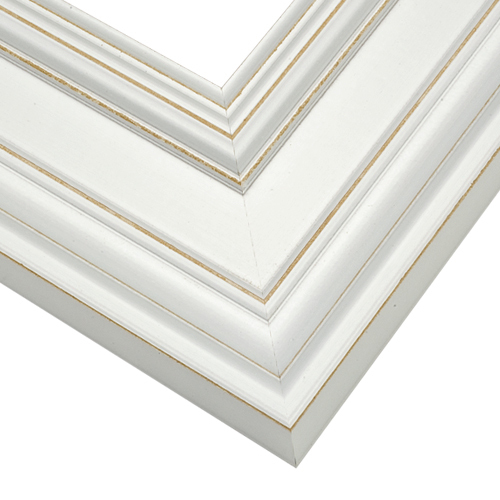 Each of our frames comes with hardware to secure the artwork inside the frame. If your canvas if larger than the depth of the frame, our customer care team can assist you with how to secure it in place. They are in the office Monday-Friday 8am-7pm eastern standard time and can be reached at 1-800-332-8884. Thank you! The frame is nice. First I received the wrong frame. Took a while to get the replacement. The first box also contained the tape roll used to pack the box. I think they will enhance my art, "red poppies." We cant wait to get our order! Thanks so much for all of the options! 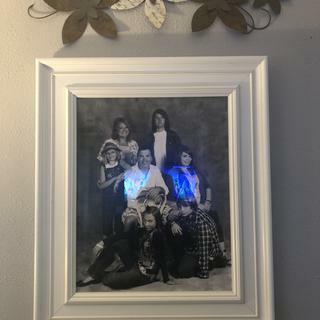 I needed a white frame and wanted something sturdy. 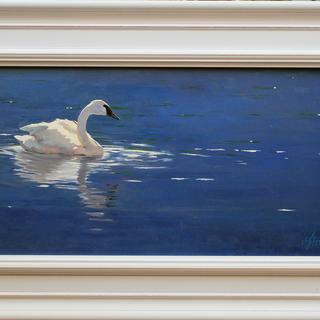 I chose it for a light colored piece of artwork that is being hung in New Orleans (a warm climate). I have a piece of glass from a coffee table that is approx 20 1/2" w x 45 3/8" l x 1/4" thick. I want to frame it to put on top of a fabric ottoman. When giving the size do I give you the exact opening for the glass to fit into it? BEST ANSWER: Hello Adele! Please enter the exact size of the glass itself to fit inside the frame. Thank you for your inquiry!